Traveling Exhibition, Education, Online Network. Africa consists of 54 countries which equal the size of China, India, the United States and a large part of Europe all put together. More than 1 billion people live on the continent and over 2000 different languages are spoken. Despite this diversity, Africa is united by artistic expressions where the element of storytelling plays a significant part. The starting point of AFRICA REFRAMED is the vivid and expressive imagery, which is one of the prominent exponents for the creative growth characterizing Africa in these years. Both photography, fashion, design, film, and other cultural manifestations explore the theme identity and the history of the continent from new and surprising angles. The disciplines extend traditions, which in the case of photography go back over 100 years. Since the beginning of the 19th century, this media has been used to explore themes as independence and the creation of identity, as well as for documenting customs and traditions from Tangier to Cape Town. Through the use of texture, bold colors and patterns, fashion and furniture designers incorporate centuries of folklore and proverbs in their creations as well. The artists reflect Africa's new role as a global entity by delving into the past and contemplate the future with a fresh pair of eyes. AFRICA REFRAMED makes it possible to take a closer look at some of the thoughts and ideas occupying the mindset of contemporary African artists across genres, and dig into an inspiring selection of feature and documentary films. The title AFRICA REFRAMED is drawn from the concept to reframe and the exhibition emphasises two meanings of this concept. Firstly, to look at, present, or think about ideas, religious beliefs, and contexts in new or different ways. Secondly, the specific meaning from the terminology of photography where it points to the act of changing focus, the point of view, or perspective through the camera's lens. 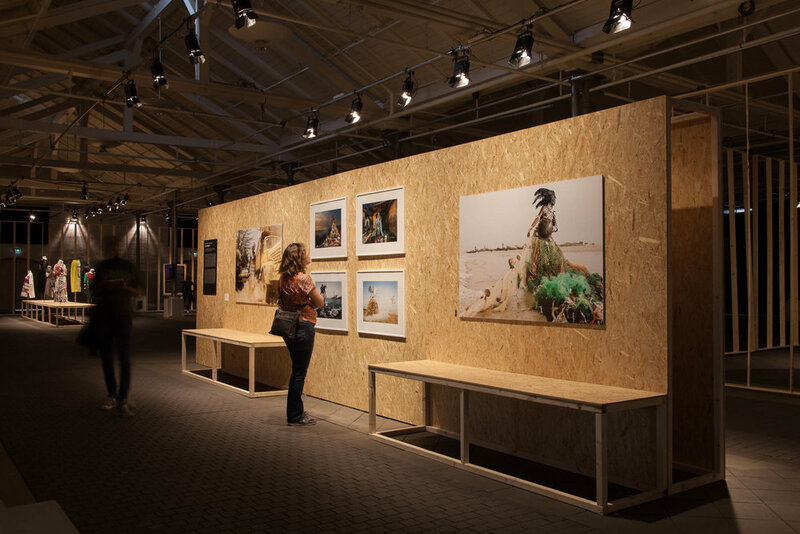 In summer 2015 Commerce & Culture proposed an idea for a photo exhibition in the 54,000 sq. ft large exhibition space Øksnehallen located in central Copenhagen. 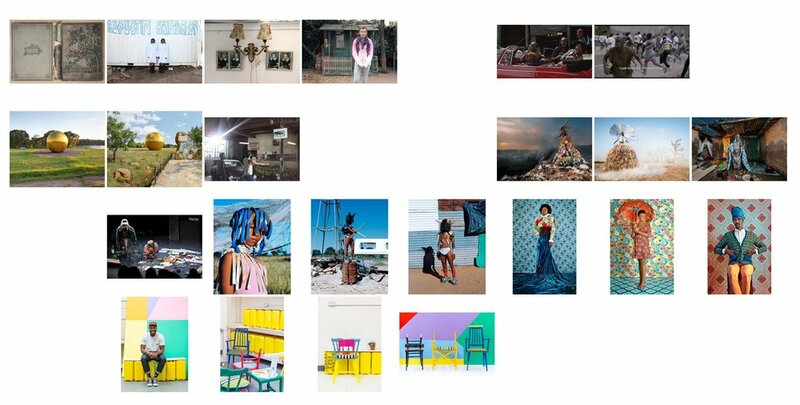 The concept revolved around new impressions on Africa seen through the eyes of some of the most iconic, contemporary African photographers. The mangement of Øksnehallen where immediately fascinated by the narrative and together we embarked on a journey to futher develop the exhibition concept we finally called AFRICA REFRAMED. Reframed, because the photographers attempt to change focus, vision and perspectives on Africa through the tangible lens of their cameras. Reframed, because our aim with the exhibition is to present the creative growth and cultural dynamics that characterize Africa right now in multiple ways through many different media. From the onset it was our intention to include the series Bamako Nights made in collaboration with the young photographers from the photo school Cadre de Promotion pour la Formation en Photographie in Mali alongside the headliners. But soon emerged the idea of expanding the exhibition with other arts and cultural expressions in order to create different entrances to the story of Creative Africa. AFRICA REFRAMED therefore came to presents photo art, fashion, furniture design, documentaries, textile workshop, food workshop, soap opera, podcasts, book store as well as feature films. We are not alone with the fascination of the thriving creativity in Africa. Numerous exhibitions of African artists are literally swarming Europe and the rest of the world. The global fashion scene has discovered the continent and African writers and musicians climb the international bestseller lists and music charts. The fascination derives partly from the complex interactions between global, national, ethnic and personal identity that characterize the works of many of the African artist and their dialogue with the world. AFRICA REFRAMED captures glimpses of this vibrant creativity. We have chosen to present a kaleidoscope of art forms and cultural expressions, but many other stories could have been told about the diverse Africa that has so much to offer right now. The school for photography named Cadre de Promotion pour la Formation en Photographie (CFP) is situated in the city of Bamako, and here young photographers are trained in making a living with commercial photography as their primary source of income. The program was developed in collaboration with the Danish organization Commerce & Culture. During their two years of training, the photography students go through a series of creative and theoretical courses, which prepare them in terms of being able to make a living from their photography, as well as teach them more about the global market and creating so-called stock photos. This involves shooting images for a worldwide image bank (Getty Images), which supplies international businesses and organizations with images for advertising, and other forms of communication. Previously, this type of photography was most often provided by non-African photographers, but by educating local photographers it gives the images a highly sought-after authenticity, and at the same time you often get a different perspective on life and development in African countries. African Photography Network is an online resource for African photography. By uniting and showcasing photographers it seeks to raise awareness of what is happening in the field of photography in Africa. Few regions remain as photographically misrepresented as Africa and African Photography Network exists to support and promote African Photographers who are taking back control of their image with a more nuanced portrayal. Commerce & Culture offers a number of individually designed workshops to local partners worldwide. The workshops teach local photographers how to produce images that can answer to the demands of the international market, giving them opportunity to expand their market reach and generate a stable source of income. In May 2013 we went to Freetown to conduct a workshop for the most talented local photographers in cooperation with the National Photographers Union. The National Photographers Union has more than 10.000 members throughout Sierra Leone, many of them former combatant from the civil war. The overall purpose of the mission was to gather information about the photography industry in Sierra Leone and identify and analyze the market opportunities. The mission was made possible with support from the LO/FTF Council. Since February 2010 we have been conducting various workshops in Bamako. The workshops have been a part of our ongoing educational and income-generating program for stock photographers in cooperation with the Malian photography school CFP Bamako. Through a continuous effort the Commerce & Culture Stock Program helps Malian photographers grow their own sustainable businesses. The program is supported by Danish Centre for Culture and Development and the Embassy of Denmark, Mali. January 2014 we were invited by the Photojournalists Association of Kenya to conduct a photography workshop in Nairobi. The workshop was held at the arts and education centre PAWA254, Nairobi's unique social enterprise through which innovative professionals from diverse artistic fields explore their creative genius to foster social change. The workshop was part of the Kenya Photography Awards prize for young up coming photographers, and put a particular focus on developing their skills in photojournalism. In May 2015 we went to Banjul, The Gambia, and conducted a week long workshop on visual storytelling with an emphasis on how to prepare and execute a photography assignment. Through theoretical teaching and practical assignments followed by sessions of teacher and peer criticism, the workshop trained the students in research, on location shooting, and editing. The workshop was offered in collaboration with Gambia Media Support and The Gambia Press Union. Mali has a longstanding and strong tradition for photography, not least due to the photographers Seydou Keïta (Mali, 1921-2001) and Malick Sidebé (Mali, 1936-2016). Both of them are world famous today thanks to their contribution to the documentation of day and nightlife in Mali's capital city of Bamako during -and after the transitional period between French rule and becoming a sovereign nation. The series Bamako Nights originate from a collaboration between Commerce & Culture - Africa Photography Network and students from the Malian school of photography CFP. The images can be divided into overall categories such as couples, half figure - male, full figure - female, interior et cetera. They serve both as a study in composition and narrative, and were later discussed and criticized among the students themselves, as part of the assignment. For those who haven't had the opportunity to experience Bamako by night, the images offer a unique insight into the city's nightlife culture, and in this sense, they also constitute an homage to the aforementioned local superstar photographers Seydou Keïta and Malick Sidebé.